"I never said we should... ugh!" Nora shot Ash a sour look and then hurried after the charging paladin, her keen eyes scanning the dark forest for a target. A peaceful resolution had always been a bit much to hope for out of these creatures, and whatever her dim-witted companions might think, Nora had no compunction about shedding blood when it was needed. The best they could do now would be to dispatch the attacking band of kobolds as quickly and brutally as possible - and make sure that one or two survived to bear the tale of the dragonborn paladin and his companions back to their clan. Nora still held out hope that the kobolds could be driven off without having to fight through the lot of them - but it clearly wasn't going to be accomplished by asking nicely. Last edited by MemoryBeast; 01-02-2019 at 09:35 AM. Spike was saddened by the sight of the dead wolf. He knew a bit about the bond between a ranger and their animal friend. The battlerager had bittersweet memories of a girl he used to know back home. She had a pet boar. Spike didn't care much for the creature. As it turned out, the girl loved her boar much more than she cared for Spike. Ash reported on his bat's reconnaissance. Spike connected the words 'Fighting' and 'Kobolds' and a joyful grin crossed his face. Spurned by Naskan battle cry, he followed as fast as his stubby legs would allow. Thoughts of malicious violence filled his head as he approached the watchtower. "Kobolds! "Lothar heard the others remark. Then, he watched the dwarf go bounding after the others. The large man held onto his giant axe in one hand and started sprinting after the paladin. As he caught up to spike and in full stride, he looked down at the battlerager. " Race Ya!" he said with a smile knowing full well that the dwarf was no match for the man's long legs. He felt some sort of kinship with the dwarf which was fueled by the bloodlust that ran through Spike's veins. Lothar felt no fear. He raced into battle with a giddy excitement. Ash's speed walking pace was quickly overtaken by the sprinting hoard of shouting companions that nearly trampled the frail warlock. Too busy dodging dragonborns and dwarves to notice the elf's annoyed glance, Ash simply sighed and began jogging after the rest of the group - bringing up the rear by a good margin out of equal parts sloth and stratagem. Peril at the cabin Naskan utters a primal cry of battle rage and rushes towards the watchtower, everyone else following closely behind. As the tower comes within range of his torch light, the paladin can see the base of it, made from sturdy timber and with a ladder going up. He can very barely make out the top. Others, however, possessing of darkvision, can see that the watchtower is about thirty feet tall. They also see two kobolds slumped near the base, arrows sticking out of their leather armor. They are standing in a clearing, with the dark forest looming just ahead. No other creature is around. At least as far as they can see. As they are still running towards the structure, Kaspar notices a steady string of blood rolling down to the ground along one side of the ladder. He looks up. There is a human like figure on the top of the tower. Before they have time to respond, an arrow whizzes by Naskan's face. Just as the dragonborn turns to face the possible assailant, another arrow punches through his shoulder armor and painfully pierces his scaled hide. There is someone here other than them. From above the tower, there is a faint cry. Faint, as if close to death. "Sniper! Take cover! ", is what you hear. If you get 16 or above, you may act immediately. The enemy got a surprise round on you. Naskan takes 6 points of piercing damage. In addition, Naskan needs to make a DC11 CON save or take a further 6 poison damage and suffer from the poisoned condition for 1 minute. You do not see the enemy yet. You can make a perception check as a free action to determine their location. If you roll 8 or below, you do not have a target and cannot attack. This only applies for the first round (unless no one attacks ). If you roll 12 or below, you attack with disadvantage. AoE attacks are normal. Above 12, you attack normally. Of course, if you do not have darkvision, you might have disadvantage anyway depending on where the enemy is. Despite what the ranger said, there isn't much cover around, other than the tower itself. Jonah, the ranger, is not doing very well. In fact, he needs someone to help him right now, or he will be dead by the end of the third round. If you want to climb the ladder, it is treated as difficult terrain. Height of the tower is 30'. You might make a DC15 athletics/acrobatics check as a free action to ignore difficult terrain. However, if you roll 10 or below on this check, you will fall and lose all actions and movement for the round. Good luck! 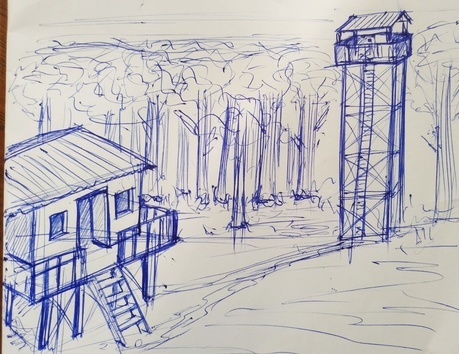 Here is a super rough sketch of the scenario you are in. Hmm... I seem to have lost track of the statuses after the last battle. Please point out corrections to the table above if there is a mistake. Last edited by undeadrajib; 01-03-2019 at 09:44 AM. Still within his bat's senses "looking" around, the warlock reacted too slowly to the shouted warning from atop the tower to act. Last edited by Agrudez; 01-03-2019 at 10:01 AM. Cursing floridly in Elven, Nora darts for cover behind one of the watchtower's wooden supports, drawing her bowstring taut as she scans the dark undergrowth beyond the clearing for their attacker. The archer, or archers, are well-concealed, but Nora's keen elven eyes detect a flicker of movement. "There! Over there, by the big oak!" She looses an arrow, but whoever is shooting them is too quick, and the arrow buries itself in a tree trunk instead. Snatching another arrow from her quiver, Nora glances around her, frantically taking stock of the situation. Naskan is wounded, but he'll live. The same cannot be said of the ranger bleeding out at the top of the tower. With her own magic expended, there's little she can do for him from down here. "Kaspar!" she hisses. "See to the ranger! We'll cover you!" OOC: Hopefully Nora's spotting can make it a little easier for everyone else to figure out where the bad guys are? Last edited by MemoryBeast; 01-03-2019 at 10:19 AM. Kaspar Thorngage Hearing Ash's report quickly followed by Naskan's roar, Kaspar tore himself from the scene and followed the others, rapier in one hand, lute in the other, his knuckles already rapping out a rhythm, seemingly of their own accord. He scanned the woods as arrows began to fly, hoping to spy a target or get a feel for how many foes they faced. Unfortunately, his normally quick reflexes failed him and he was unable to make out anything in the dark underbrush. At the ranger's call of "take cover", the tiefling dropped prone, at least until he could make out a target. Last edited by Spinrad; 01-03-2019 at 10:21 AM. Jumping in surprise to the arrow lodged in Naskan's chest, Spike looked around for an assailant. Spying the silhouette of a creature in the woods, he growled, "Arrows are for sissies! Come out and fight!" The battlerager swung his greataxe around in a showy display. This did little but waste time when he should have been attacking the enemy. Last edited by Huhart; 01-03-2019 at 10:32 AM. An arrow lodged in his chest and little idea where the missile had come from, Naskan growled in defiance as he could feel the poison's attempt to flow through his veins. He would not be downed so easily. The dragonborn attempted to move among the watchtower timbers, hoping to avoid another arrow buried beneath his scales. Last edited by tomplum; 01-05-2019 at 06:01 PM. Peril at the cabin It all happens too quickly. Only Nora is able to respond swiftly enough. Her keen eyes once again ferret out the bad guys from within the dark woods. But they seem too quick for her arrows. At least she points out the general direction of the enemy to her companions. Ash tries using bat's senses to locate the sniper. Kaspar goes prone on the ground, to give the opponent a smaller target. He fails to spot anything among the trees. Spike issues a challenge to the attacker to face him in melee. One they do not seem to have wholly embraced. With the ranger's help, the dwarf does recognise a shape moving among the trees. Naskan, his flesh pierced by a poison tipped arrow, finds shelter between the legs of the watchtower, hoping to get some cover from the assault. He too can now spot the Archer hidden among the trees. Two more arrow fly out of the woods, from where Nora had spotted the attacker. One sails past Ash, while the other manages to hit Spike. The barbarian sees the fuzzy shape change position after shooting its bow. Once again, it becomes one with the darkness and disappears from his view. Spike takes 4 points of piercing damage. In addition, please make a DC11 CON save and take a further 7 points of poison damage and suffer from the poisoned condition for 1 minute if you fail the save. You have to make another perception check before attacking as a free action; as the enemy has changed position and used its bonus action to hide. You do know the general area, so if you roll 12 or below, you attack with disadvantage. AoE attacks are normal. Above 12, you attack normally. Remember, if you want to climb the ladder to help Jonah, it is treated as difficult terrain. Height of the tower is 30'. You might make a DC15 athletics/acrobatics check as a free action to ignore difficult terrain. However, if you roll 10 or below on this check, you will fall and lose all actions and movement for the round. He has about 2.5 rounds left in him! "Kaspar!" Nora repeats, more sharply now. "The man up in the tower! He'll bleed out!" She darts out from behind the tower leg she's using as cover, drawing a bead on a shadowy shape among the trees and loosing an arrow. "I've no healing magic left, and I doubt that ladder could even hold Naskan. Is there nothing you can do?" Last edited by MemoryBeast; 01-05-2019 at 03:36 PM. Ash dodges - surprised by his own agility - the arrow coming for him and immediately sends his familiar in the general direction that it had come from. Using its blindsight, it attempts to find the man. And the familiar manages to find the archer and bears down on him to distract. Ash follows the path his bat takes and attempts to spot the opponent with his own eyes as well. But his ability to parse the man's location isn't quite as good as the bat's. With a sigh, the warlock steps towards the forest and speaks a single word in a deep, demonic sounding voice. As he waited to see if his spell would take affect, he commanded his bat to begin to harass the man - providing a distraction for any future attacks from the rest of the group. He then followed Kaspar's lead and dropped prone to the ground for cover. Ash action: Using a warlock spell slot on the spell Command to force the man to spend his next turn running out of the woods and towards the warlock should he fail a DC 13 WIS save. If he fails, he must then do everything in his power to come to within 5 ft of the warlock on his next turn. If he can't reach 5 ft from normal movement, he will use action dash and/or bonus cunning action dash to get there. Once he is within 5 ft (or has exhausted all of his ability to do so) then his turn ends (ie. no attack from him next turn if he fails - just movement). Last edited by Agrudez; 01-05-2019 at 04:24 PM. Kaspar Thorngage Nora's sharp voice finally caught his attention. He nodded, realizing as he did it, no one was looking at him to see him do it. "On it," he calls out in reply, rising and sheathing his sword ("Fat lot of good it's doing anyone anyway..." he thinks sourly as he turns and runs for the ladder. As he runs, Kaspar looks for a vantage point where he can see the ranger, while also keeping eyes out for their assailant. As he rounds the edge of the tower's front and can see Jonas, Kaspar sings a single word - "vyyy LE cit..tt..tt..", stretched into a sort of short song. Having done what he can for the range, he spins towards the woods again. Thinking he sees their adversary moving, he turns his song to a sort of rhyming insult, trusting his magic to distract their foe and hoping to lend some measure of advantage to his companions. reeking of goblin piss and rancid tallow!" Injured badly and bleeding, Naskan had little choice but to channel the healing powers of Bahamut through his body lest he succumb to another volley. He stayed hidden behind the timbers of the tower, hoping to catch a glimpse of their hidden quarry.